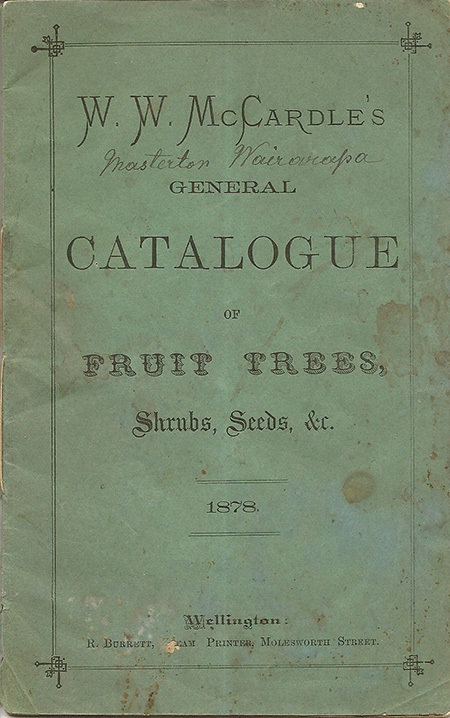 The 1878 McCardle catalogue has been used as a guide by the Heritage Gardeners for planting fruit trees, flowers and other shrubs. The catalogue informs us what plants would have been available to farming families and people living in the villages and towns of the Wellington Province in mid-Victorian period of New Zealand settlement. William Wilson McCardle was born in Scotland and migrated to New Zealand, arriving in Lyttleton in 1863. He acquired his gardening and orcharding skills when he was employed for two years by John Greenaway, a Christchurch nurseryman. In 1869 he moved to Dunedin and founded his own nursery. Six years later, he sold out and established a nursery in Masterton. The Cyclopedia of New Zealand (1897) says 'McCardle's apple orchard, stocked with its hundred fruit-bearing varieties, was soon the talk of the Wairarapa.' Nursery Road, in Masterton, is where the orchard was located. The Masterton City Council website informs us that in 1877, Mr McCardle was one of the first Trustees elected to establish a public park in Masterton, which is now known as the Queen Elizabeth Park. In his book 'A very public reserve' Gareth Winter (2008) writes that Mr McCardle started laying out the grounds in the winter of 1878. The McCardle descendants advise that he laid out the planting plan for the grounds and his family helped plant the many beautiful ornamental trees that grace the park today. Mr McCardle was an influential Member of Parliament. He died in 1922 and is buried at the Mangatainoka Cemetery. This plant list of seeds has been copied from the W.W. McCardle 1878 catalogue. The common name used in New Zealand has been added beneath.